The first Europeans known definitely to set foot in Newfoundland were the Norse. Beginning in the eighth century, they burst out of their cultural homeland in Scandinavia (particularly Norway) in a series of expansionist waves of migration triggered by unknown causes — possibly overpopulation, possibly political unrest. Their notorious war galleys, known as "longships," were fast and maneuverable, perfect for swift hit-and-run raids in the sheltered seas and waterways of Europe. Going on such raiding expeditions was known as going "a-Viking," and it was by that name that the Norsemen became feared throughout Europe. Yet the Norse who came to Newfoundland were not fierce raiders in search of pillage and plunder. The Norse appearance here was the final step in a relatively peaceful expansion of livestock farmers across the North Atlantic, taking in parts of the British Isles, Iceland, Greenland, and finally Vinland. The Norse who settled in Newfoundland probably wore clothing similar to this outfit which was excavated in Herjolfsnes, southwestern Greenland. From Geoffrey Ashe et al., The Quest for America (New York: Praeger Publishers, ©1971) 103. Courtesy of the Nationalmuseet (The National Museum of Denmark), Copenhagen, Denmark. The Norse expansion into the North Atlantic occurred between 800 and 1000 CE, and may have been caused by a combination of population pressures and political unrest in the Norse homeland. Norsemen appear to have left their homeland in search of a place where their old customs and freedoms were not so threatened. Iceland, discovered by the Norse in 860, appears to have been settled by ca. 874 and was fully occupied by 930. Indeed, the occupation of Iceland was so rapid that the island soon felt the pressures of overpopulation. By 975 a major famine had struck, so that interest in finding new lands for expansion remained strong. Rumours of lands to the west, possibly fed by earlier Irish voyages, led to the discovery of Greenland in 982 by Erik the Red. Three years later, a major colonizing expedition of several hundred people was organized in Iceland and sailed to Greenland. Eventually around 300 farmsteads were established in southeastern Greenland, clustered into two settlements. The oldest was the Eastern Settlement. The more suitable of the two for livestock farming, it was the most heavily populated region, with about 3,000-4,500 people. For this reason, the Eastern Settlement survived into the 1400s. The Western Settlement was about 160 miles further north along the Davis Strait. Though it was closer to northern hunting grounds, and had a promising beginning, it never had a population greater than 1,000-1,500. It was the first of the two areas to experience decline, so that by about 1350 it had disappeared. Though their culture was a violent one by our own standards and blood feuds were common, the Greenland colonists were not bloodthirsty sea-raiders. Nor were their vessels the classic "longships" used by Vikings in the sheltered waters of Europe on their raiding expeditions. In the North Atlantic, the Norse used stout, sea-worthy vessels known as "knarrs." Although there were limits to how much they could carry, they were more suited for carrying cargo.The knarr was also open to the elements and, though driven by a sail, it was small enough to be rowed. Most knarrs were built in Europe and exported to Greenland. This made Greenland dependent on secure trade links with Europe. The people of Iceland and Greenland supported themselves through livestock farming and trading. The region was not suited to growing grain, and so the raising of sheep and goats dominated the agricultural economy. Stock-raising of this type, together with the impact of substantial numbers of people moving into Icelandand and Greenland, caused environmental degradation. Trees were felled to heat homes and smelt iron, and turf was stripped from the thin soils. The result was erosion and soil damage. To make matters worse, after 1250 AD, a period of climatic cooling known as the "Little Ice Age" began, causing the agricultural economy of the region to deteriorate dramatically. It is necessary to explain all these developments if we are to understand why the Norse failed to colonize North America successfully, for it was from these Greenland settlements, and not the Norse homeland in Europe, that the Norse explorers of North America came, around the year 1000. From Jónas Kristjánsson, Icelandic Sagas and Manuscripts (Reykjavik, Iceland: Saga Publishing Co., ©1970) 16. According to the sagas, a merchant-shipowner named Bjarni was making his way from Iceland to Greenland in 986 CE when he was blown off course by a severe storm. When the storm ended, he found himself off an unfamiliar shore. He recognized that this was not his intended landfall. The land was too forested, and he was too far south. Bjarni therefore headed north, arriving in Greenland about a week later. During the return trip, he noted a changing landscape as he progressed north, from forested hills, to a flat, heavily forested coastline, to glaciated mountains. This had not been an intentional voyage of discovery, nor was Bjarni interested in following through on his discovery. As a merchant, he was interested primarily in trading with established communities, not investing in risky and speculative efforts to establish new ones. It was an attitude that would be shared 500 years later by the merchants of Bristol. The Greenland colonists were not interested in immediately exploiting the new discovery, for they had just recently arrived in Greenland. Because they were still busy establishing themselves, Bjarni's voyage did not inspire a return trip for nearly a decade. Then Leif, the son of Erik the Red, retraced Bjarni's route in reverse. He passed a land of rock and ice, which he called Helluland – probably Baffin Island – and then a country that was flat and wooded, which he called Markland. This was probably part of southern Labrador. He eventually reached a land which the sagas describe as a land of grassy meadows, with rivers full of salmon, and enough other resources to encourage over-wintering. Leif gave this land the name "Vinland." The men proceeded to build houses in typical Greenland Norse fashion, with sod-walls and peaked roofs of timber and sod. When Leif and his crew returned to Greenland, their reports of this new land aroused interest in further exploration. Courtesy of Ben Hansen. From a postcard entitled A UNESCO World Heritage Site. 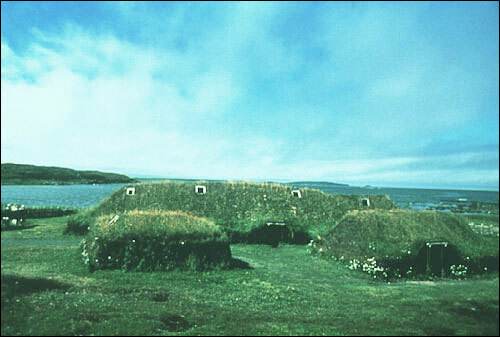 Early Viking habitation at L'Anse aux Meadows, Nfld. Published by H.H. Marshall Ltd. St. John's, NL. One such expedition was led by Leif's brother, Thorvald, who was able to locate Leif's wintering place. Thorvald was eventually killed in a skirmish with local natives that the Greenlanders called "Skraelings." From the saga descriptions, it is impossible to say whether these Skraelings were Indians or Inuit. Another brother, Thorstein, attempted to sail to Vinland but spent much of the summer fighting contrary winds and seas before giving up and returning to Greenland. The most ambitious effort was led by Thorfinn, and included women and livestock. This expedition apparently remained in Vinland for two or three years, but eventually abandoned the effort after hostilities broke out with the natives. Thus, the discovery of Vinland was not followed by successful settlement and exploitation of the New World. Where was Vinland? The location is difficult to determine because the details provided in the sagas often seem to conflict. The sailing directions suggest Newfoundland, but descriptions of lush vegetation, including grain and self-sown wheat, together with the discovery at L'Anse aux Meadows of butternuts (which have never grown further north than New Brunswick) suggest a more southerly location. 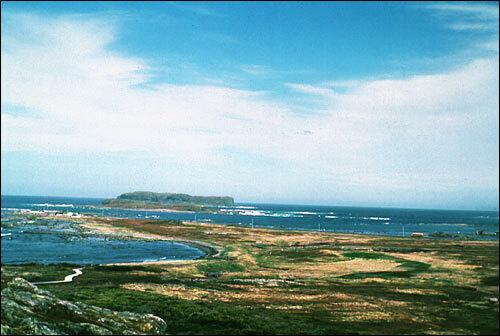 The discovery of the Norse habitation at L'Anse aux Meadows gave powerful support for those who believed that Vinland was in Newfoundland. 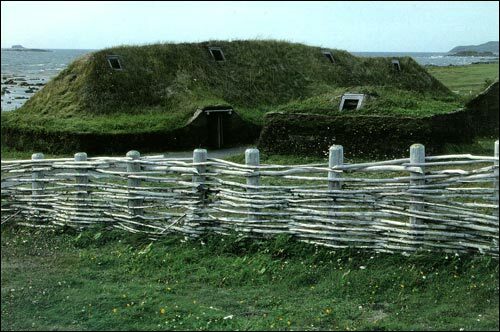 Yet L'Anse aux Meadows appears to have been a small settlement of about eight buildings and no more than 75 people, mostly sailors, carpenters, blacksmiths, hired hands and perhaps even serfs or slaves. It is probable therefore that the settlement was a base camp for repairing and maintaining Norseships. One bloomery and one smithy have been identified, where local bog iron was apparently smelted into "sponge iron," then subsequently purified and made into nails, rivets, and other iron work. The settlement was probably also a base camp for expeditions further south. During the summer, possibly two-thirds of the camp would have been off exploring as far south as the Gulf of St. Lawrence. Courtesy of the Department of Canadian Heritage, Parks Canada, Federal Archaeology. ©Her Majesty The Queen in Right of Canada. Reproduced with the permission of the Minister of Public Works and Government Services, Canada. Photo by André Corneiller. Some women must have been present — artifacts found there, such as a spindle whorl, bone needle, and a small whetstone for sharpening, were a typical part of a Norsewoman's everyday possessions. 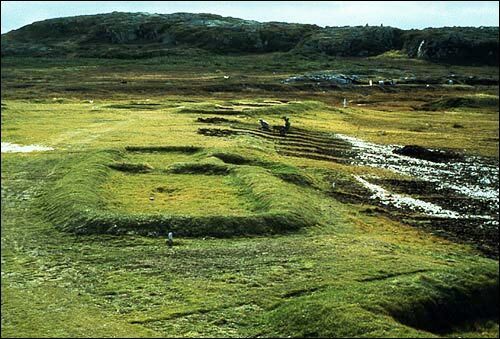 Nevertheless, archaeologists have concluded that the habitation there was little more than a seasonal camp, never occupied for more than a few seasons, and certainly never developing into the sort of permanent settlement which had been established in Greenland. 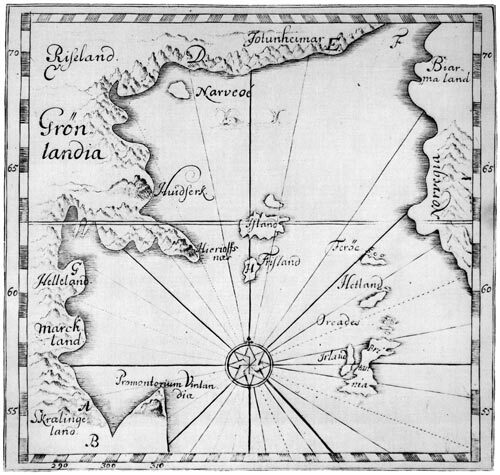 The consensus among scholars today (1997) is that "Vinland" was not a specific site, but a region which included Newfoundland and extended south into the Gulf of St. Lawrence as far as Nova Scotia and coastal New Brunswick. Another important question is why the Norse failed to settle permanently in North America. How was it that they could survive in Greenland for 500 years, but could not establish themselves in Vinland, with its richer resources and better climate? Vinland was a remote place, and voyaging there was risky and uncertain, as we know from the sagas. Moreover, the Norse expeditions met strong resistance from the native inhabitants. The level of technology of the Norse was not significantly more advanced than that of the natives and this, combined with the small numbers of Norsemen in America, meant that they had no decisive advantage. Courtesy of the Department of Canadian Heritage, Parks Canada, Federal Archaeology. ©Her Majesty the Queen in Right of Canada. Reproduced with the permission of the Minister of Public Works and Government Services, Canada. Photo by Birgitta Wallace. In the early 11th century the Greenland settlements were still young and in their pioneering phase, and did not have the population nor the wealth to support a new colony so far away — and never would have. There was also little incentive, in that the economy which developed in Greenland did not need expansion to America. There might have been some incentive later in the history of the Greenland settlements, as they became increasingly less viable, but by that time — the13th and 14th centuries — the inhabitants were preoccupied with their own survival, and would not have had the resources or the interest to create a new colony. Greenland was a fragile colony, incapable of sustaining itself as climatic, economic, and political conditions deteriorated. According to Thomas McGovern, a leading authority on Norse expansion to North America, "Greenland simply did not produce enough people or riches to act as a successful base for sustained colonization attempts, and Norse Greenlanders may have seen little immediate benefit in expending either in Vinland." (McGovern, 285-308). Geoffrey Scammell concurs: "The Norse had gone as far as they were going....as the settlements in Iceland and Greenland decayed they were deprived of bases, material and incentives for any further endeavour." (Scammell 9). Greenland represented the practical limit of medieval Europe's extension into the North Atlantic. The Norse contact with Newfoundland was fortuitous and the significance of their experience quite limited. Although they were probably the first Europeans to live in North America, however briefly, we cannot really say that they "discovered" America. As Daniel Boorstin explains, "What they did in America did not change their own or anybody else's view of the world....There was practically no feedback from the Vinland voyages. What is most remarkable is not that the Vikings actually reached America, but that they reached America and even settled there for a while, without discovering America." (Boorstin 215). European discovery of North America, including Newfoundland, in the sense of being aware that this was an new world to them, and a new opportunity, would have to wait until the era of John Cabot.